Do you have what it takes to keep Parka Pete from falling off the igloo? In Igloo Mania, players take ice blocks off the igloo one at a time and try not to make the whole structure crumble. Great for kids and adults alike. This fun themed ice igloo game is a great way to spend time with your little ones as their eyes light up trying not to make Pete fall. Igloo Mania is intended for younger kids around five and up. Up to four other players can also join in the fun. 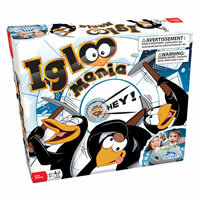 Give Igloo Mania as a gift today or get one for yourself. The player with the lowest score wins. You get 64 ice blocks, 4 penguin ice picks, 1 Parka Pete, a support dome, base ring with door, stickers and the official Igloo Mania game rules and instructions. Please keep in mind that the official Igloo Mania childrens rules and instructions could be different depending on the game version you have. The rules below are some of the exact directions on how to play Igloo Mania. Share with us your comments, funny stories, tips, advice, strategies, creative ways to play, questions about how to play, problems with the rules or anything you want about Igloo Mania. All submissions will be reviewed within 24 hours. Click here to add your Igloo Mania comments.